The Lieutenant Governor attends hundreds of special events, ceremonies and celebrations throughout the Province. Accordingly, the planning of the Lieutenant Governor’s schedule takes place several weeks in advance. It is requested that invitations for the Lieutenant Governor be submitted six weeks in advance of an event. To invite the Lieutenant Governor to an event, a letter of invitation is required in accordance with proper protocol. The role of the Lieutenant Governor; for example: presentation of awards, brief remarks, etc. 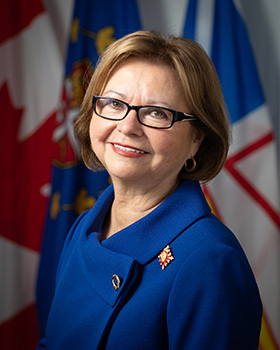 When the Lieutenant Governor accepts an invitation, the Events Manager at Government House will contact the organization extending the invitation. Protocol guidance and other pertinent materials, if any, are also provided by the Office of the Lieutenant Governor. Within one month of the date of the function, the organizers will be contacted to clarify any questions. The Events Manager will provide assistance concerning protocol and timelines, such as: the time of arrival of the Lieutenant Governor; greeting at the door; reception; introduction of the Lieutenant Governor by the master of ceremonies; playing of the Royal Salute; seating arrangements; departure procedures; and so forth. Note: Any changes to the event agenda after initial consultation with the Events Manager must be approved through Events Manager prior to the event. An Aide-de-Camp will be assigned by the Events Manager. The Lieutenant Governor – always pronounced: lef´ten-ent gov´er-ner – is the highest ranking in Newfoundland and Labrador. Specific protocol exists to ensure appropriate respect for the Lieutenant Governor as the representative of the Queen. When addressing the Lieutenant Governor in person, use: “Your Honour”. When referring to the Lieutenant Governor, always use: “Her/His Honour”. The spouse of the Lieutenant Governor is also addressed in the same manner. When the Lieutenant Governor and spouse are together, they are addressed as “Your Honours” and referred to as “Their Honours”. Full title: The Honourable Judy May Foote, P.C., O.N.L. Her Honour The Honourable Judy May Foote, P.C., O.N.L. Her Honour, The Honourable Judy May Foote, P.C., O.N.L.